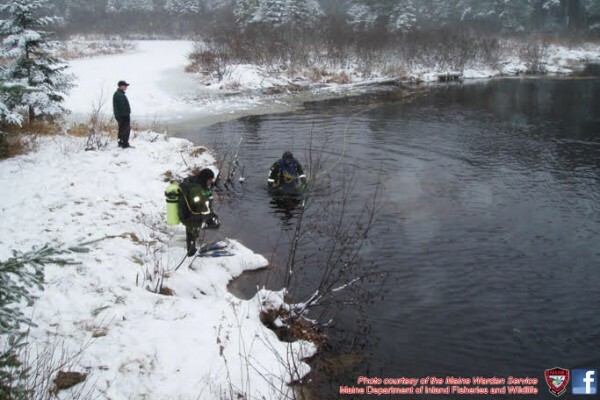 Maine Warden Service divers search Umbazooksus Stream for missing Canadian man, Renald Poulin, in December 2013. TOWNSHIP 6 RANGE 13, Maine — The body of a Canadian man who went missing last November is believed to have been found Tuesday in Umbazooksus Lake, according to the Maine Warden Service. Cpl. John MacDonald of the Maine Warden Service said Tuesday evening in a press release that the body is believed to be of Renald Poulin, 67, of St. Come Quebec. He said a Maine Warden Service pilot who had been scanning the area for Poulin, while surveying ice conditions on northern Maine lakes, located the body at about 10:45 a.m.
Game wardens on the ground arrived several hours later with watercraft to retrieve the body, which was located about two miles northwest of Umbazooksus Dam on the western shore of the lake. MacDonald said the body will be taken to the state medical examiner’s office in Augusta to determine a positive identification. “The Maine Warden Service has been in contact with the family of Mr. Poulin since the search began last November, and we are hopeful the family will now have closure,” MacDonald said. State game wardens began searching for Poulin after they located Poulin’s vehicle while searching for two Millinocket men in an unrelated incident, MacDonald said. Authorities in Canada also had been searching, he said. The search was suspended Dec. 13, 2013, as heavy snow began to fall in the area. Efforts were to resume when temperatures began to melt snow in that region in the spring. Poulin crossed into the United States on Nov. 26 and was supposed to have returned Nov. 27. On Nov. 30, game wardens located his green 2002 Kia Sedona, MacDonald said, adding that Poulin may have been in the area because of his interest in the train rail systems in the Umbazooksus Lake area used decades ago in the logging industry. The ice on Umbazooksus Lake and nearby small bogs and wet areas made detecting evidence of Poulin especially difficult, the corporal said. Weather conditions needed to improve significantly before further searching. Teams comprised of wardens, forest rangers and search and rescue volunteers conducted a combination of grid, hasty and K-9 team searches. During the last days of searching in December, temperatures remained at about 10 degrees, and snow began to fall. While the ground search was suspended, aerial flights had started to occur again as snow and ice began to melt, he said. Ground searches had been planned for next week.